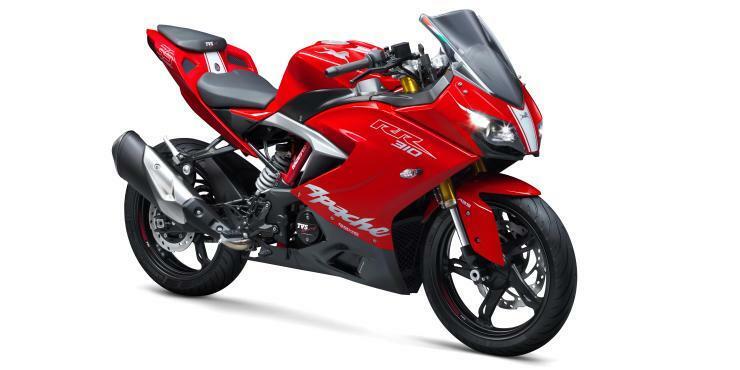 TVS Motors has just launched a new flagship sportsbike – the Apache RR 310S. Developed with extensive track racing inputs and technological assistance from BMW Motorrad, the new motorcycle sits right at the very top of TVS Motors’ range, and is priced at Rs. 2.05 lakhs ex-showroom Delhi. Bookings will open soon, and deliveries will begin from the end of this month. The Apache RR 310S competes with the KTM RC390 but is priced much cheaper given that the latter costs Rs. 2.34 lakh rupees. However, the KTM is much more faster, and more powerful. The Apache RR 310S is powered by a 313 cc, four stroke engine with liquid cooling, an additional oil cooler, fuel injection, twin overhead camshafts and four valves. The short stroke (80 mm bore and 62 mm stroke)motor puts out 34 PS of peak power at 9,700 rpm while peak torque is rated at 27.3 Nm, coming in at 7,700 rpm. A six speed manual gearbox is standard, with 8 clutch plates handling torque transmission. TVS claims a quick 2.93 second 0-60 Kph run, a 7.17 second 0-100 Kph sprint, while top speed is an even more impressive 160 Kph. The motorcycle uses a newly developed trellis frame that’s said to be stiff yet very light. The bike tips scales at 169.5 Kgs. Suspension bits are the most advanced yet for a TVS motorcycle, what with upside down Kayaba front forks and an adjustable, gas charged monoshock rear. Disc brakes on both the wheels are of petal-type, for better heat dissipation. ABS is standard, so is RLP (rear wheel lift off protection). RLP is a unique safety feature that ensures that the rear wheel doesn’t lift-off even during very hard braking. Both tyres on the road even during hard braking translates into shorter stopping distances, and of course, better safety. The fully faired bike gets a drag-coefficient of 0.26, which TVS claims is best-in-class. A 11 liter fuel tank is standard. Other impressive bits about the bike include hazard lamps, a 15 function instrument cluster with readouts for lap times, top speed, average fuel efficiency and instant fuel efficiency, a gear shift light, a side stand alarm and twin LED projector headlamps. The bike gets a 180 mm ground clearance, keeping Indian conditions in mind, and rides on 17 inch alloy wheels shod with Michelin tubeless rubber (110/70 section at front and 150/60 section at the rear) made by TVS Tyres (Yes, they make Michelin tyres in India). Needless to say, this is the sharpest looking motorcycle that TVS has ever-built, and something that’s got to go to match the show.